The Andean Amazon is being rapidly altered by a wave of hydropower development and the consequences have been underestimated, according to newly released research. A team led by professor Elizabeth Anderson from the FIU Institute of Water and Environment documented 142 existing dams and 160 proposed dams for rivers draining Andean headwaters of the Amazon. The researchers are concerned the proposed dams could result in significant losses in river connectivity, threatening fish populations and forever changing river channels and floodplains. 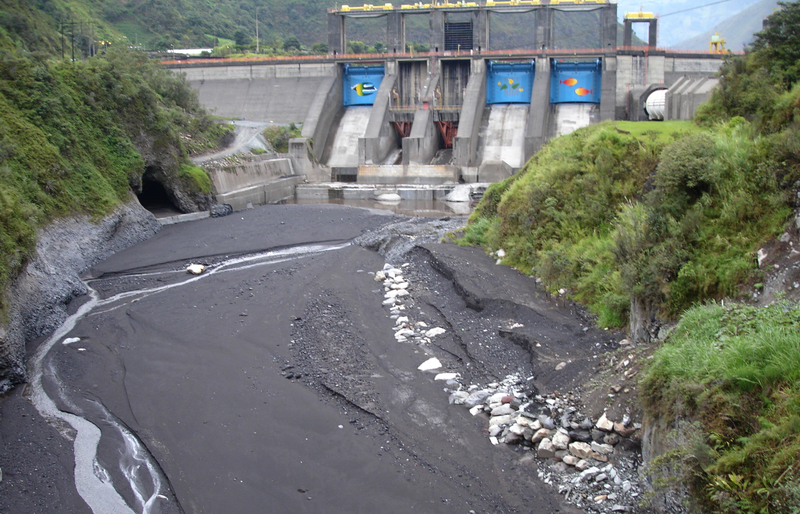 This hydropower project in Ecuador is one of many impacting the Andean Amazon. The greater Amazon is one of the most prolific, biodiverse habitats in the world and Andean rivers have a disproportionate influence on the lowland areas. Andean rivers also predominantly define the formation of rivers downstream, controlling their curves and sediment. With as many as 5,000 species of fish inhabiting the waters, the rapid development of hydropower is a potential threat to these species that are a primary source of food and income for the 30 million people who live along the Amazon basin. If the proposed development continues, only one of the eight major Andean Amazon river systems would be left unimpeded. There are also cultural implications for native people who live along the rivers, some of whom believe the waters are sacred. The team collaborated with local governments and conservation organizations to compile international data on the dams, assembling the most comprehensive database of dams in the Andean-Amazon region. The result is a system-wide look at the overall impact, which presents a very different picture than when assessing impact of individual dams on individual systems. “I hope that by showing the regional trends and that there is widespread river alteration happening, this research can lead to more coordinated development and help to highlight the importance of keeping some rivers free-flowing in the region,” Anderson said. The research team’s efforts are already paying off. The international collaboration behind this research has led to the formation of a new initiative, Rios Vivos Andinos, which aims to facilitate more regional scientific analyses that examine the linkages between river flows, freshwater biodiversity, and human well-being. Anderson and her collaborators recently received funds from the MacArthur Foundation to support these efforts. The research was published this week in Science Advances and is a collaboration between 15 institutions spanning eight countries. It was supported, in part, by grants from USAID, the MacArthur Foundation, and the Amazon Fish Project.